An influential Israeli rabbi has renounced his own comments that Israeli soldiers died in battle because they were not ritually observant Jews. The comments by Ovadia Yosef, a former chief rabbi of Israel and the spiritual leader of the ultra-Orthodox Shas political movement, outraged bereaved relatives and lawmakers across the political spectrum. On Tuesday, Israeli media reported that Yosef meant soldiers from biblical times, not Israeli soldiers killed in last summer's war against Lebanese guerrillas. "Is it any wonder that, heaven forbid, soldiers are killed in a war, when they don't observe the Sabbath, don't observe the Torah, don't pray every day, don't put on phylacteries every day?" Yosef asked during his weekly Saturday night sermon. Eli Yishai, a Cabinet minister and head of the Shas party, said Yosef was "misunderstood," and that his sermon referred to biblical-era soldiers who died because they had not prayed before battle. 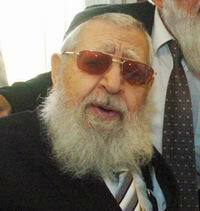 Yosef, 86, is no stranger to controversy. He called for then-Prime Minister Ariel Sharon to be struck down by illness after Israel's withdrawal from the Gaza Strip in 2005. Sharon suffered a debilitating stroke in January 2006 and has been in a coma ever since. Yosef also called Hurricane Katrina "God's retribution" against President George W. Bush for supporting Israel's Gaza pullout.